Ms. Bresnik received her Bachelor of Arts degree in International Relations and a minor in Asian Studies from the University of Delaware in 1991 and also did a study abroad program at Kansai Gaidai University, Osaka Japan from 1989 to 1990. She received a Master of Arts degree in Asian Studies/Japanese from the University of Texas at Austin in 1994, and a Juris Doctorate degree from Rutgers School of Law at Camden in 1999, during which she also did a summer law program at Doshisha University, Kyoto, Japan in the summer of 1997. She then received a Master of Laws degree in International Law from the University of Houston in 2007. In 2012 she was a NASA Fellowship recipient and attended the Space Odyssey Institute. Ms. Bresnik started her legal career in 1999, clerking for the Superior Court of New Jersey, in Camden, New Jersey. She then took a position as Associate General Counsel for the Office of the General Counsel of the Air Force at the Pentagon in 2000. During her time at the Pentagon she also worked for the Undersecretary of the Air Force for International Affairs doing international armaments cooperation agreements. She was also detailed to a high-level working group to review U.S. Air Force Academy's cadet complaints concerning the Academy's program of deterrence and response to sexual assault allegations. In 2004, Ms. Bresnik took a position with Northrop Grumman's Air Combat Systems and Unmanned Air Systems in Rancho Bernardo, CA. She was responsible for establishing a joint venture company in Germany, which would act as the national prime contractor in providing unmanned air vehicle capabilities to the German Ministry of Defense. In 2004, Ms. Bresnik joined the Office of Chief Counsel at NASA's Johnson Space Center (JSC) and is presently the Associate Chief Counsel for International Matters and the lead attorney for International Space Station (ISS) legal issues. In this role her duties include advising on the multimillion dollar negotiations and purchases of crew transportation, rescue and related launch services for NASA astronauts to the ISS; advising on international issues and contracting between the ISS Partners--the European Space Agency, Japanese Space Agency, Russian Space Agency and Canadian Space Agency; and agreements in furtherance of NASA exploration beyond low earth orbit. She is also Export Control Counsel for JSC. 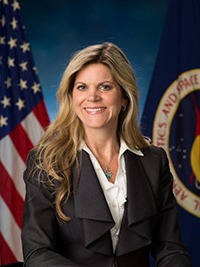 For her legal achievements, Ms. Bresnik has been awarded the NASA Exceptional Service Medal, 2014, 2018, 2017 Military Spouse JD Network Professional Excellence Award 2018; NASA Legal Linda Carol Slade Caring Award 2014; the General Counsel Forum-Magna Stella Award 2013 for Outstanding Assistant Counsel; NASA Exceptional Achievement Medal, 2011; Space Flight Awareness Award 2013, 2015, 2016; NASA Legal Teamwork Award, 2012, 2013, 2016; JSC Center Director's Commendation Award, 2008; Superior Accomplishment Award, 2006 and 2007, and an Exemplary Civilian Service Award for Distinguished Performance from the Department of the Air Force (2002). She was also inducted into "Rutgers-Camden Finest" in 2016. Born in Ridgewood, New Jersey. Married to Astronaut Colonel (ret.) Randolph James Bresnik of Santa Monica, California, they have a son and a daughter. She enjoys travel, Tae Kwon Do, reading, numerous volunteer and community service activities and especially spending time with her family.